Anyone reading this who is old enough to remember Mood Rings, Pet Rocks or “Bicentennial Minutes” will probably recall ads for Jungle Habitat on TV. It was an African safari theme park operated by Warner Brothers in the early to mid 1970s where you could drive your car through fields where “wild” animals, such as lions, zebras and elephants, roamed free. The park was located way up north in West Milford near Greenwood Lake and the NY state border. I remember going there myself as a kid of about thirteen, clad in a pair of striped bell-bottom trousers, “desert boots” and a shirt with a collar large enough to rival the Flying Nun’s. 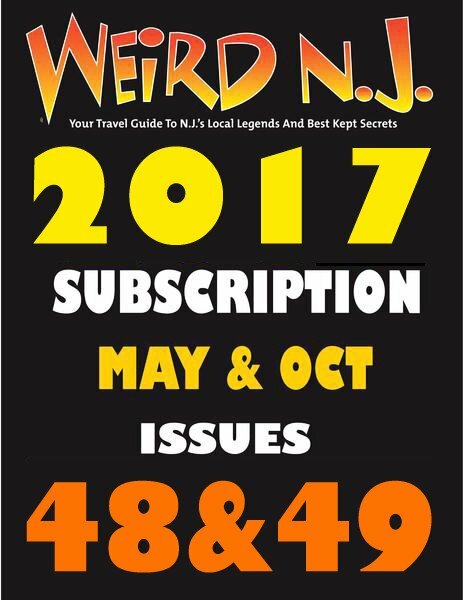 Over the years Weird NJ had received reports sporadically from the West Milford area of sightings of non-indigenous species of animals, such as monkeys and kangaroos, roaming the woods there. It was always rumored that these were the descendants of escapees from Jungle Habitat. Still, for some reason we never though to actually go to the site of the old abandoned park until this new tip came in. When we did go we could hardly believe what we found. Turning off the Greenwood Lake Turnpike in West Milford, we headed up a hill toward the small Greenwood Lake Airport. An old billboard on the side of road said “Nairobi Airport.” This, we assumed, was a vestige from the Jungle Habitat days. Right next to the mountaintop airfield stood the massive and imposing gates that bore the words JUNGLE HABITAT in giant wooden letters. It was like we were entering the gates of Jurassic Park, in more ways than one. Not only did this entrance look reminiscent of the gates shown in that movie, but as we walked through them we were actually traveling back in time. Even though everything was overgrown and had reverted to a true wilderness state, I could still recognize the place from my visit there over twenty years before. 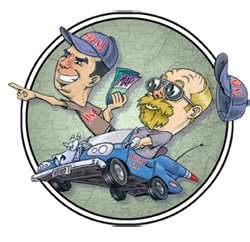 Visit our Amazon store.cracked with weed poking up everywhere. We listened to the sounds of animals moving in the trees around us hoping to catch a glimpse of a monkey or baboon. 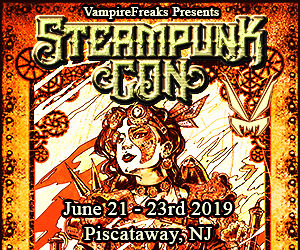 There were expansive and desolate parking fields right there in the middle of the woods where throngs of daytrippers once parked their wood-paneled station wagons. We were amazed when we finally reached the main exhibit area. Everything for the days when the park was open was still there; ticket booths, picnic tables, bathrooms, food kiosks, souvenir shops and even the little zebra striped safari cars! We toured the animal pens and the reptile house. A wave of nostalgia washed over me as I recognized the exact spot where I had once had my picture taken sitting on the back of a giant lumbering tortoise. Everything at Jungle Habitat was indeed still there–except the animals. After our abandoned safari I couldn’t help wondering what when wrong at Jungle Habitat. From all accounts that we had heard, the closing of the park was a hasty and somewhat messy affair. After some research we discovered that Jungle Habitat had actually been a strange place since the day it first opened its doors to the public. Even at the height of its popularity as a thriving tourist spot, Jungle Habitat has always been home to incredible stories. 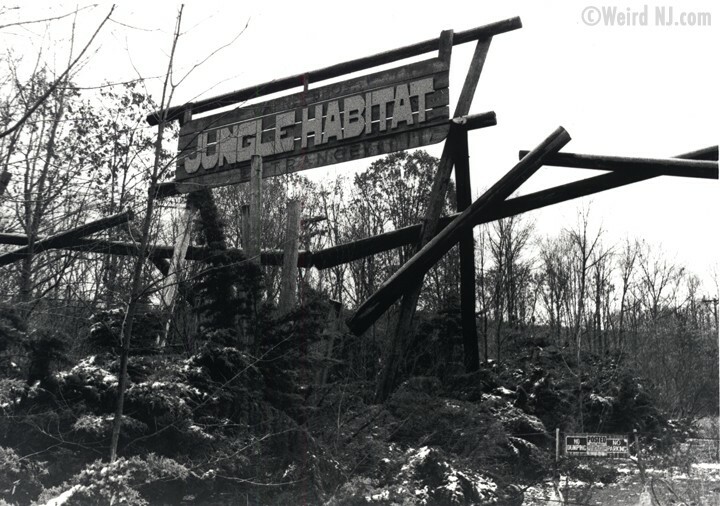 The first time Jungle Habitat made headlines occurred only months after it first opened for business in the summer of 1972. An Israeli tourist named Abraham Levy was riding through the safari in a taxi cab, when he decided to roll down the window to get a better look at some of the animals roaming around. Two lions attacked the car and mauled the 26 year old tourist, causing not only lacerations to his face and shoulder, but a ton of negative publicity for the park. The melee died down shortly however, when Levy publicly took responsibility for the incident. By year’s end, West Milford residents were up in arms again. The outcry was due to reports of animals escaping into the wilds of West Milford. Besides sightings of harmless animals like peacocks, there were rumors spreading about dangerous animals, such as a pack of wolves and a lion, being sighted along local roads. These reports are probably the earliest of the now legendary animal escape stories associated with Jungle Habitat. On December 16, 1972, the New York Times ran an article on the fears of West Milford residents. “There have been a lot of rumors about animals escaping,” said a woman who raised the point herself in an interview. “I have small children who go up on the back roads and who are very curious about things. I can’t say it doesn’t worry me.” These sentiments, voiced twenty eight years ago, are identical to the rumors still running rampant today. We’ve been told tales by West Milford residents who looked out in their back yards to see ostriches wandering through. Another even claimed that he remembered a band of baboons running amuck in the town’s pharmacy. What some people do not realize even to day is that many of the reports of escaped animals were actually founded in fact. Emus, baboons and even wolves were just some of the uncaged critters which were known to have escaped the park. Many reports that our readers have shared with us focus on the rumors that when the park closed animals were left behind to fend for themselves and pry upon one another. While this is not true, there were dead animal carcasses left behind unburied park the Habitat pulled up stakes and left town. After being picked apart by a few of our native turkey vultures these dead animals might very well have looked like lion or wolf kills. If this was seen by a hiker it would undoubtedly be enough fodder to fuel the rumor mill concerning feral carnivorous predators loose in the West Milford woods. Right after the park closed in October of 1976, some animal carcasses were left outside. This pile grew until thirty animal bodies, including that of an elephant, a bison, a camel, and some zebras, were all left lying until April, when the ground had thawed enough to finally bury what was left of the bodies. The six months that they were left exposed was a violation of state laws, which stated that any animal should be buried within forty eight hours of its death. Despite this violation, Warner Brothers was not sanctioned. Jungle Habitat is gone now, but not forgotten. Reports of mysterious kangaroos sightings in remote corners of West Milford still turn up from time to time. We’ve been told stories of everything from monkeys in the trees to vicious “hell hounds” roaming the environs of nearby Clinton Road. 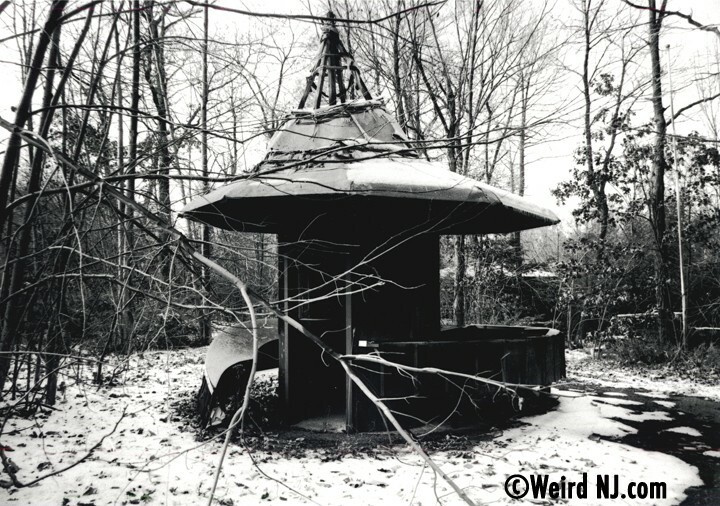 Most of the remaining structure that stood during Weird NJ’s first visit to Jungle Habitat have since been torn down. The sign that once stood at the gate was “set free” and now resides in the back yard of one West Milford resident. For me there will always now be two Jungle Habitats; the hot and smelly wild safari park that I remember from my youth, and the long-abandoned ruin I explored later in life, when things started getting really weird. Back in the early 80’s, myself and a few friends drove into Jungle Habitat with a couple of Volkswagen Bugs. It was pretty cool, like driving into a ghost town. It was like they just pulled up stakes and blasted town. Jungle Habitat closed in 1976. I was about nine years old when I took a look at the Herald News that my parents were reading. Before they could warn me, I came face to face with images that were immediately seared into my mind–horrible photographs of rotting mutilated animal carcasses. I remember just staring at those pictures, examining every detail, absolutely numb and frozen with terror, before my parents realized what I had seen, and they did their best to explain how this disgrace could be allowed to happen. Follow the Law of the Jungle–Or Else! 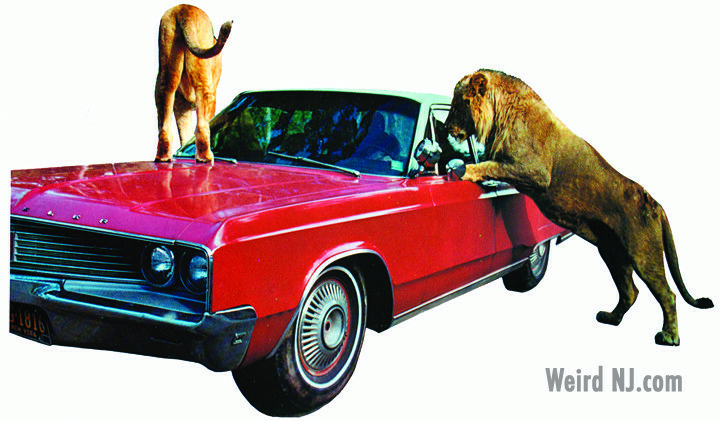 On the opening day Jungle Habitat created a 28-mile traffic jam full of overheated cars. The park became a booming success, yet it closed after a few years. It closed due to the fact that the township of West Milford would not allow them to do what they pleased. Warner Brothers wanted to make Jungle Habitat even bigger. During the period that the Safari was open a lot of animals escaped on numerous occasions. Once an emu escaped the park, and since emus are like ostriches and can run very fast, they were unable to bring him back before anyone would notice. A lot of people spotted this particular emu and still remember that incident to this day. This Internet story is only an excerpt of the information we have published on this subject. 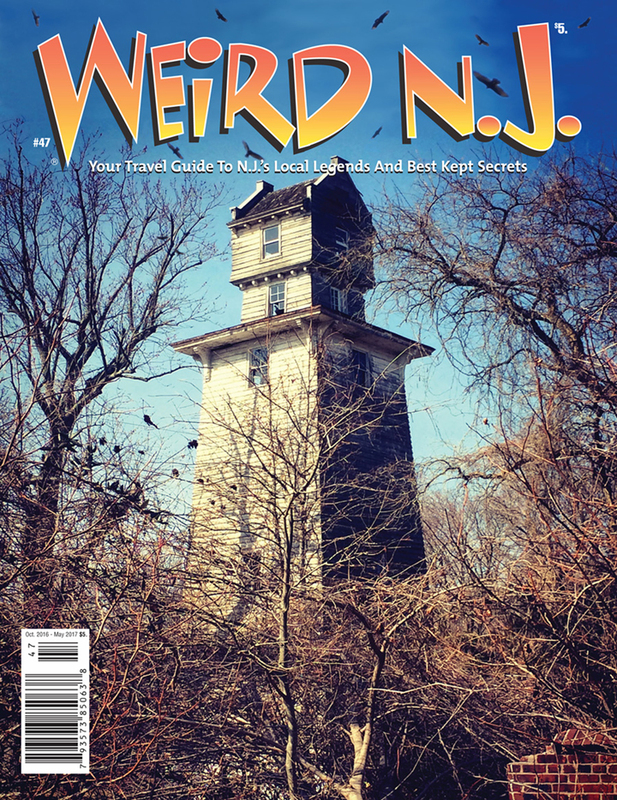 For the full story we suggest you refer to past issues of Weird NJ Magazine or our book Weird NJ: Your Travel Guide to New Jersey’s Local Legends and Best Kept Secrets. 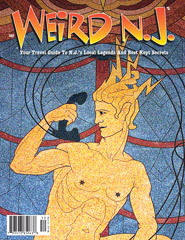 If your local book seller, newsstand or convenience store doesn’t carry Weird NJ, just tell them to call us toll free at 1-866-WEIRDNJ and we’ll be happy to stock your favorite store for you. This entry was posted in Abandoned and tagged escaped animals, Greenwood Lake, Safari Park, Warner Brothers, West Milford. Bookmark the permalink.